In 12-inch nonstick skillet, heat 1 tablespoon of the oil over medium-high heat. Add eggs; cook 30 to 60 seconds, stirring until scrambled and firm. Transfer mixture to plate; cover to keep warm. Wipe out skillet. In same skillet, heat 1 tablespoon of the oil over medium heat. Add carrots, zucchini, garlic, pepper flakes and salt; cook 2 to 3 minutes, stirring frequently, until tender. Transfer to 4 bowls; cover. In same skillet, heat remaining 1 tablespoon oil over medium-high heat. Add chicken and green onion whites; cook 5 minutes without moving, then stir and cook 3 to 5 minutes longer, until chicken is no longer pink in center. Return eggs to pan. Add brown sugar and soy sauce; cook 1 to 2 minutes or until liquid evaporates. Add chicken mixture to bowls. Sprinkle with green onion greens, peanuts, cilantro and mint. Serve with lime wedges. A spiralizer or julienne peeler turns vegetables like carrots or zucchini into spiraled, curly pasta-like strands. For the best spiralized carrots, opt for fatter carrots. 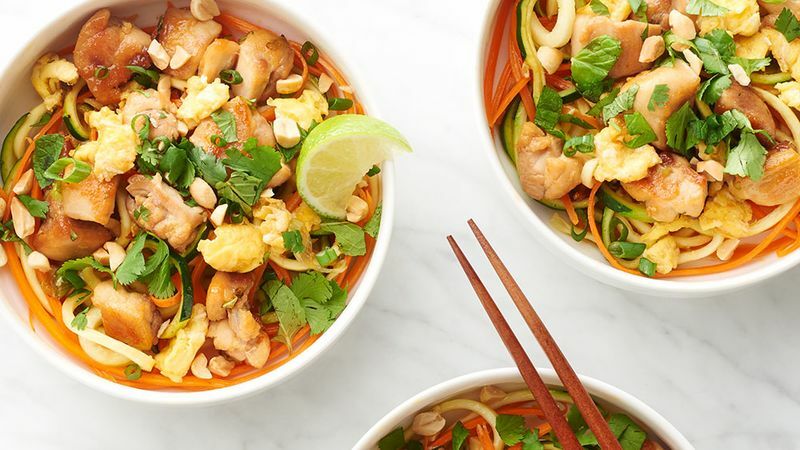 For stress-free Pad Thai, have all your prep done before even heating the skillet.